Bio-Synthesis offers RNA-peptide conjugates in high quality and yields by using various strategies, according to project specifications. Methods in preparing peptide-oligo conjugates are post-synthetic conjugation (or post-assembly conjugation and fragment coupling strategy), total stepwise synthesis (or on-line solid phase synthesis), native and template-directed ligation. These RNA-peptide hybrids have been become increasingly important in antisense therapy, due to the identification of peptides as viable carriers for enhancing the cell delivery of antisense oligonucleotides. RNA and peptide syntheses are produced in-house and conjugated by our expert scientists in bioconjugation chemistry. Each peptide RNA hybrid is meticulously monitored at each production cycle according to the stringent quality assurance and quality control standards of Bio-Synthesis. The final product is identified by mass spectrum and purity is analyzed by high throughput capillary gel electrophoresis. Bio-Synthesis is committed to Total Quality Management (TQM) to ensure customers' complete satisfaction. MS and HPLC analyses are performed following the completion of RNA, peptide synthesis and cross linking DNA with peptide. QC (quality control) and QA (quality assurance) procedures are also followed independently to double guarantee the high quality of every delivered oligo-peptide conjugate. Bio-Synthesis's has successfully upgraded its Total Quality Management System (TQM) to fully comply with ISO 9001:2008 regulations. The price depends on the method used in obtaining peptide-oligo conjugate. Please contact us for a quotation. Single-stranded oligonucleotides are usually chemically modified by incorporating various nucleoside derivatives, to protect against degradation by serum and cellular nucleases. Double-stranded RNA is generally sufficiently stable in cell culture for non-modification uses, but is also heavily modified with nucleoside analogs for in vivo use. 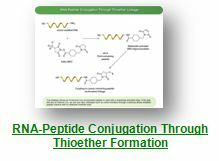 Methods in preparing peptide-RNA conjugates are post-synthetic conjugation (or post-assembly conjugation and fragment coupling strategy),total stepwise synthesis (or on-line solid phase synthesis), native and template-directed ligations. There are uses in NHs ester-maleimide mediated conjugation chemistry, such as incorporating peptides and N-terminal Cys to react with a maleimide activated oligo. If the peptide has an internal Cys, we use other strategies such as forming oxime from a hydroxyl-amine modified peptide reating with an aldehyde modified oligo. Although the price for using other strategies for making peptide-oligo conjugate is the same, the price for obtaining other modified peptides, RNA oligo or different cross-linking chemistries that include either stable or cleavable linkages may be higher. Product is HPLC purified and usually over 85-95% pure. All RNA and peptide syntheses and conjugation processes are manufactured under strict quality control processes. Analytical HPLC and MS analyses are performed in every development cycle. Final target conjugates must first be isolated from excess or unreacted reagents by gel filtration. Then, size-exclusion chromatography (SEC) or reverse phase (HPLC) may also be used to either remove excess reagent or isolate and characterized the cross-linked product. Once the product has been purified, it may be subject to many different types of studies including spectroscopic (MALDI-TOF,ESI, LC-MS Fluorescence) or electrophoresis studies. QC (quality control) and QA (quality assurance) procedures are also followed independently to offer you double guarantee for the highest quality possible. Final quantity is systematically validated by UV absorbance at 260 nm. Moreover, our dedicated technical account managers will guide you through every step of the process and constantly keep you informed of the latest project progress. The typical delivery consists of lyophilized sample in individual, fully labeled vials.The shipment also contains COA, MS, HPLC and/or other analytical data. Additional analytical data is also available upon request. Contact our Technical Service Center at 800.227.0627 or contact us online with your detail oligo-peptide project specifications, a project manager will be assigned to help you with design and develop an appropriate synthetic method for your specific needs.